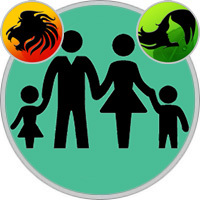 Between the Virgo-child and the Lion-parent, a special relationship is established that generates the deepest devotion. Leo admits that his child has all the unique qualities of the Lion, but hesitates to declare them, and the Virgo looks with admiration at the magnificent Lion. It is because the Virgo is so reserved and does not expect praise that Leo will never put it in its place. Smart Virgo will be happy to stay in the back seat and let the car drive to someone else. Therefore, Leo will be able to lead the whole family. Between the Virgo and the Lion, peace and harmony reign. The only question arises: if the parent attracts the Lion’s share of attention, what does the Virgo get? In any case, Virgo does not hide with unhappy views in the corners. Virgo has other interests, she does not want to constantly look in the mirror and admire herself. And the Lion, if he is satisfied with himself, becomes an indulgent master, pouring out love, generosity and kindness on others. Therefore, the Virgo will not have to be in the shadows: she will be next to the Lion standing at the ramp and will bask in the rays of his glory, without applying any effort. Leo mom does not stint on love and understanding, and this gives confidence to her rather shy child. Mother teaches the Virgo to acquire friends, to have fun with pleasure, do not be afraid of anything and succeed in everything. Lioness considers her children to be a continuation of herself, and if she has any unrealized dreams, she expects her children to do it for her. That’s why she can exert too much pressure on Virgo, because she needs results! The personality of the little Virgo is very different from her mother’s personality. The Lion prefers to be visible, in the first roles, while the Virgo agrees to remain in the shade. The Lioness is eccentric and full of fire, and the prude Virgo sometimes wants to hide, when the mother starts to admire herself. Of course, there is a danger that this mother will eclipse her child, but if she tries to realize her own dreams through Virgo, it’s even worse. Mother Leo will perceive as a personal failure that the Virgo could not meet her overstated requirements and did not justify her hopes. But the poor Virgo is already demanding of herself, so criticism of the mother will be superfluous. It is better for a child to focus on one’s own hobbies and on one’s own strengths. And of course, any encouragement of the mother will be received with gratitude, only they should not be rude, and Lion mom should listen more often to his child, taking note of his opinion and not trying to punish the know-it-all. This child has an inquisitive mind, and when the mother takes him somewhere with him, he will look at everything with interest, not missing any details (especially if it concerns the past, for example, in a trip to historical places). A mother can help a Virgo to use its potential, and then the little Virgo will cease to worry and underestimate herself. She will better cope with life, discovering that she is capable of much. Usually, Mother Leo is proud of Virgo, because it is obvious that a child, working with such a return and taking his studies so seriously, will achieve high results in school. The lioness teaches her little Virgo to be more generous and not too prudent. And Virgo, feeling the love of such a bright personality as her mother, begins to appreciate himself more, and therefore, in life will achieve more. The Leo father, guided by the Sun, radiates love and warmth, and the little Virgo senses its radiance. She simply adores her big, strong father, who, she thinks, knows the answer to any question and is always ready to protect her. Of course, Leo is very fond of his child, although he considers his child’s worldview too narrow - in comparison with his broad outlook on life. And Virgo, in spite of her love for her father, sometimes thinks that his judgments are very much too hasty and that he is simply not able to see everything perfectly. But between them there is complete mutual understanding, and everyone considers the other to be a very special person. Leo dad likes to be in the spotlight, and he just bathes in adoring his child. And on the little modest Virgo make a huge impression of his theatricality and eccentricity. Despite her external unpretentiousness, she believes that it would not hurt her to have the same self-confidence. Father Leo gives orders to obey, and his word is law. Virgo can resist the rough commands of his father or just do not react to them. But if she sees that the father is just, a reasonable discipline will only benefit her. However, the requirements should be calm and accompanied by explanations - only then it will give a positive result. The lion, as a rule, acts harshly, believing that this is the only way to raise an ideal child. But the Virgo will always seem to be far from ideal, especially if the father fails to strengthen her fragile self-confidence. Father-Leo - a person so impressive that he can get all the attention of others and his child will have little left. He should try to share his glory with the Virgo, sometimes using a sense of humor to let everyone know that they are one. Well, another nuance: although the little Virgo adores the father for being so gorgeous and daring, he still should not embarrass her with too theatrical behavior somewhere at the parents’ meeting or in front of her friends.